We took Shepler’s ferry over from the mainland from Mackinaw City, Michigan to Mackinac Island. It’s a short 15-minute ride that feels more like crossing the ocean somewhere in the Caribbean with the same deep blue colors and many high waves. When we arrived on the island, you feel the excitement and energy of all its visitors—many visiting for the first time and others bringing back memories of their past family vacations with their annual visit. In creating the best family memories, it’s all about where you stay. Our adventure began at Mission Point Resort. 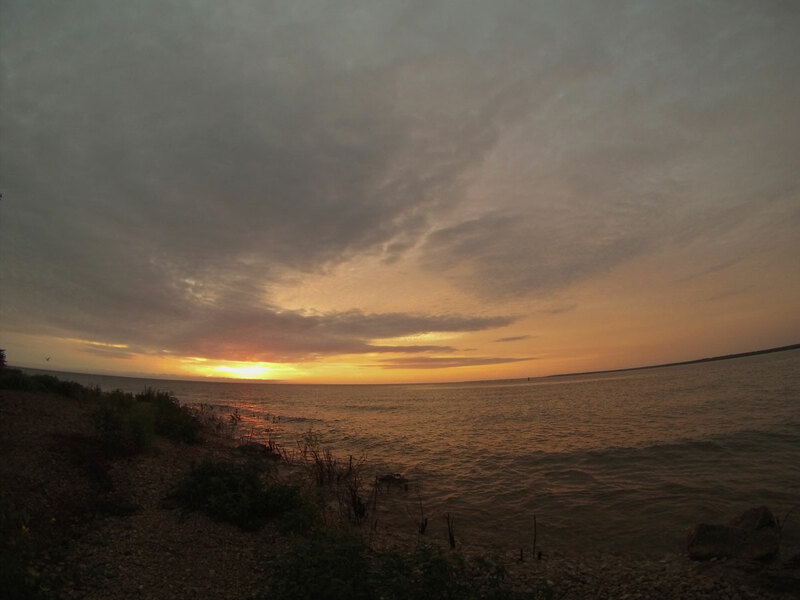 From many of the pictures, it might seem like a small hotel, however, you will be surprised just how big it really is—and beautiful—set on 18-acres of lakefront. The best part is that sections of the hotel seamlessly blend with the houses around town, walking paths blend with small roads and views from your room might just be to the lush gardens of the neighbor’s house or a horse and carriage galloping past your room (as the island is a car-free zone). Our 2-bedroom suite was perfect and spacious for the entire family, with crisp white bed sheets and very comfortable beds and plenty of room for all. Mission Point has a long history and it’s part of the island culture, transformations and additions throughout the years and a recent multi-million dollar renovation—and also a recent TV appearance. New to the Hotel is the Lakeside SPA. It is hands-down the biggest on the island, offering full-service treatments and a hair/nail salon. In the near future, a new bigger pool will be built overlooking the lake (I think an infinity pool will look great!). Our family enjoyed pool-side snacks at their current pool and it was the perfect way to enjoy a relaxing afternoon at the resort. During breakfast, you could spot all types of people from families to honeymooners. We were lucky to have sunny days, so we sat on the porch and enjoyed stunning views of the water and the well-manicured gardens at Mission Point. Hard to miss is the teepee-shaped lobby, built with 51-foot logs of virgin Norway pine—it’s just a great place to hang out next to the fireplace. 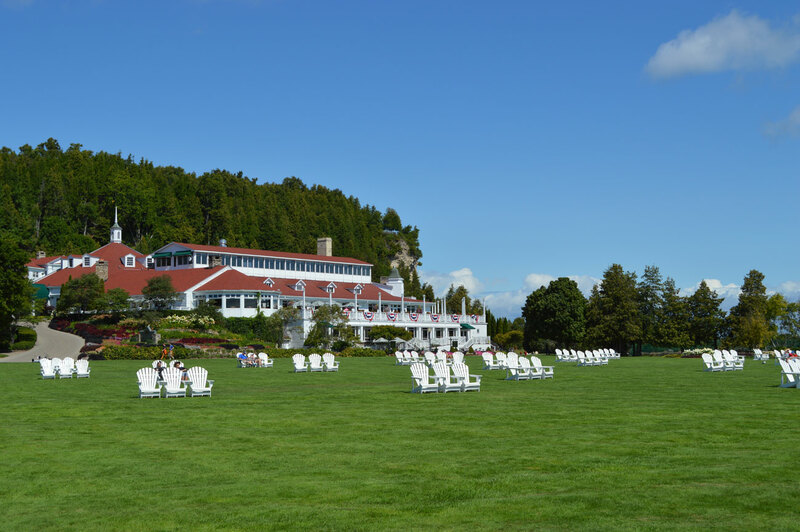 Activities are endless in the small island of Mackinac and within Mission Point. 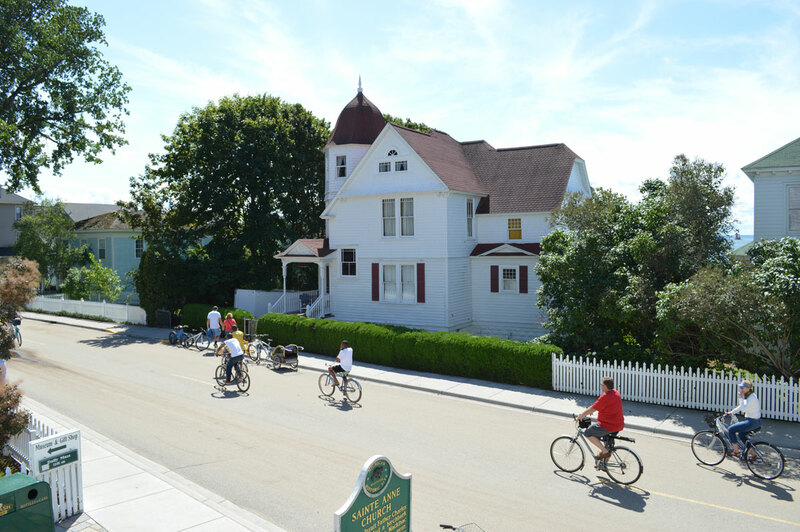 You can do anything from biking around the island, playing mini golf, croquet or bocce ball, relaxing on one of the many Adirondack chairs on their massive lawn or catch a movie at the Mission Point theater. Interesting fact: It’s the only theater on the island and a scene in “Somewhere in Time” with Christopher Reeve was filmed there. One stay there and we can see why people make it an annual trip. 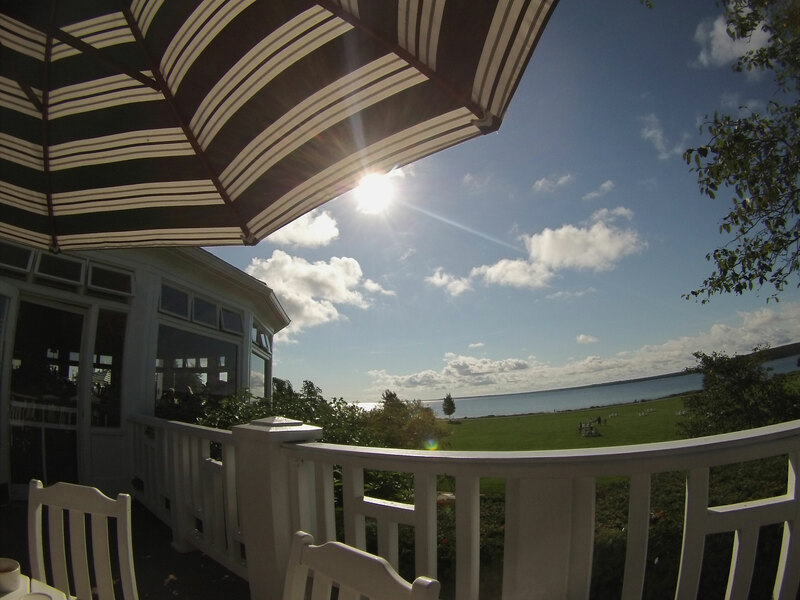 This is where we ate breakfast every day… Best view at Mission Point!